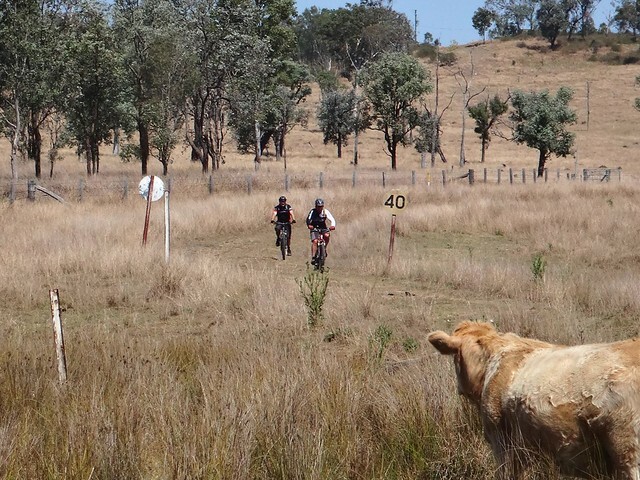 Totdays adventure was a point-to-point ride from Blackbutt (on the Great Dividing Range) to Toogoolawah (in the Brisbane Valley) via portions of the Bicentennial National Trail through Emu Creek and Anduramba. 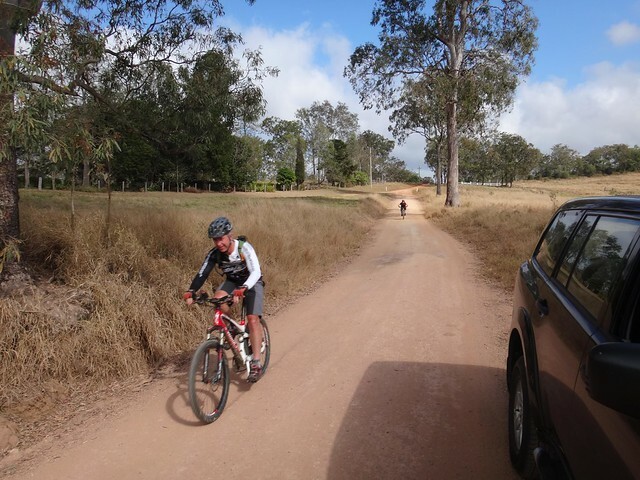 I drove the support vehicle while Darb and Eric rode the mountain bikes. 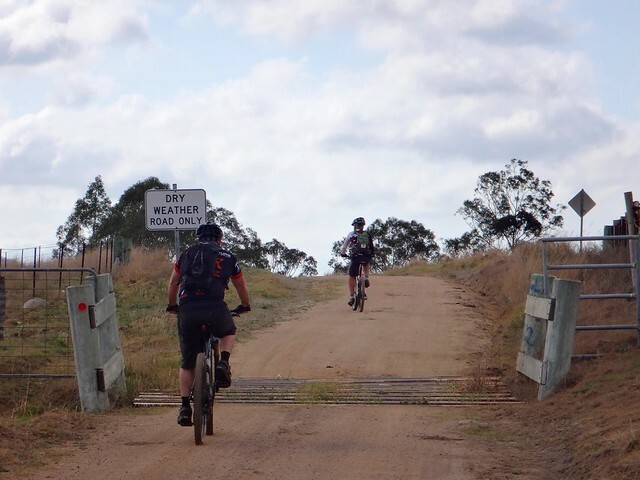 Although I’ve ridden through here several times before via the Brisbane Valley Rail Trail, this was my first look at this section of the Bicentennial National Trail. 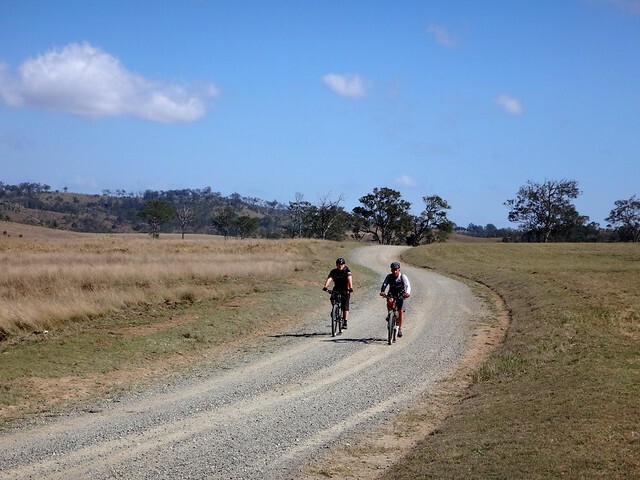 My friends Graham and Rients had ridden some of our route a week or two before us, and graciously gave me their track log to help me plan our ride. 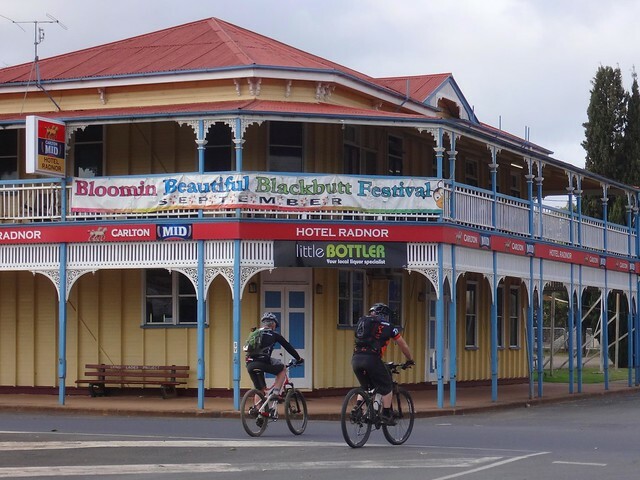 Blackbutt is a beautiful little town. The cool thing about the local pub is that it still has rings on the posts outside so you can tie up your horse. It was too early in the day for us to pay a visit to the “Radnor” Hotel, so we set off out of town along the road to Crows Nest. My plan was to drive ahead, set myself up, and take some pics of the guys as they rode past. 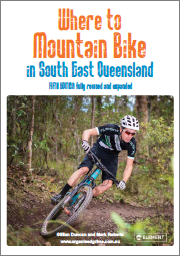 But I underestimated how fast mountain bikes can go. Eric and Darb are strong riders, and although I had driven what I thought was a reasonable distance, as soon as I got out of the car and looked back, they had caught up with me. I yelled some obscure abuse at them to slow down, but they just laughed at me. The rolling farmland here had a unique beauty. The horizon felt like it was further away than usual and the sky seemed higher. 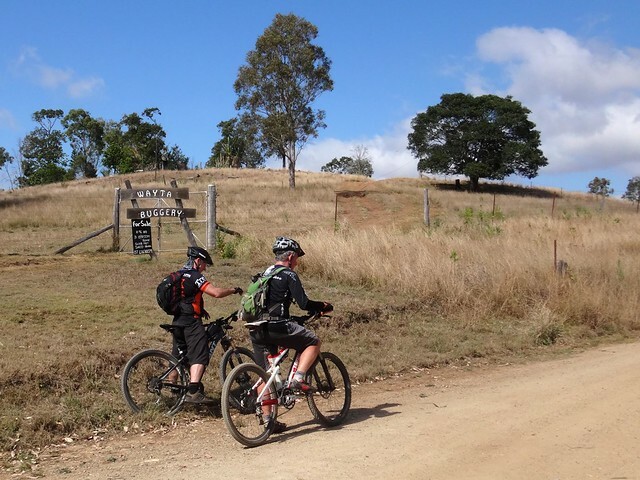 Eventually the plains gave way to a steep descent, and we dropped down to Emu Creek. Although this boulder-strewn creek is quite shallow, it becomes a raging torrent after heavy rain. The landscape changes from year to year as it is continually sculpted by floodwaters. Today, thankfully, the creek crossing was a mere trickle. After the creek crossing we had a steep climb out of the gorge with gradients of up to 25% for almost 1km. 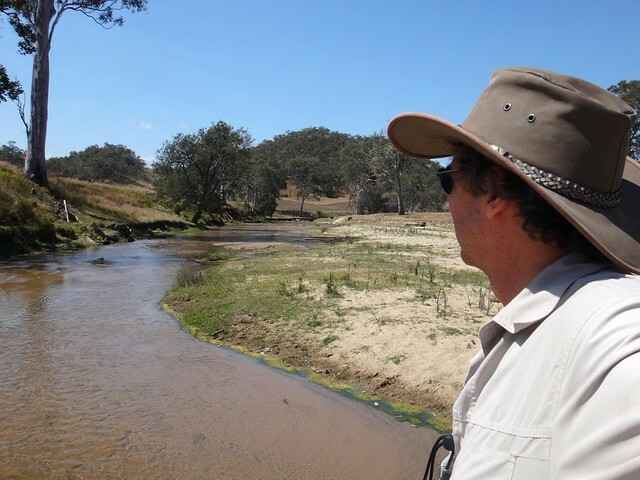 Huge granite boulders towered over us on one side, while the hill dropped sharply down to the creek on the other. This is a stunning trail. 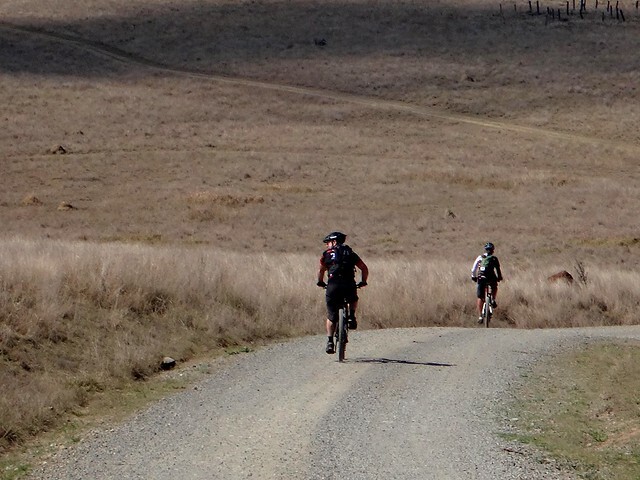 Eventually the steep grind gave way to more rolling plains. We encountered this fascinating property at the top. If you’re interested, “Wayta Buggery” is for sale. It’s in the middle of nowhere, but I suspect this would probably be a “pro” not a “con” for the right buyer. 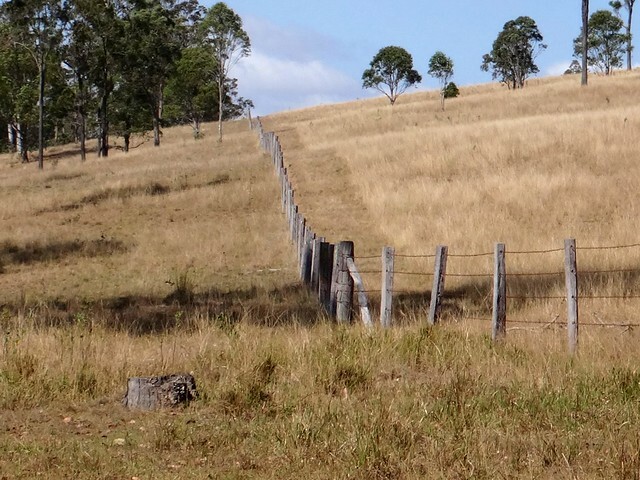 The road wound through numerous cattle properties and over countless grids, lazily following the contours of the land. Although Darb and Eric were working quite hard, I enjoyed the slow drive – not having to worry about deadlines. If you ever feel like a leisurely relaxing drive for a few hours, this is the perfect route. It’s good for the soul to stop once in a while to soak in the panorama and be dwarfed by the landscape. Perhaps that’s part of the reason that Eric and Darb kept catching up with me. Stopping to take pictures, losing track of time, I shouldn’t have been so surprised when I looked up to see them rolling past me. At this point the route of the Bicentennial National Trail became a bit confusing. It has recently changed. 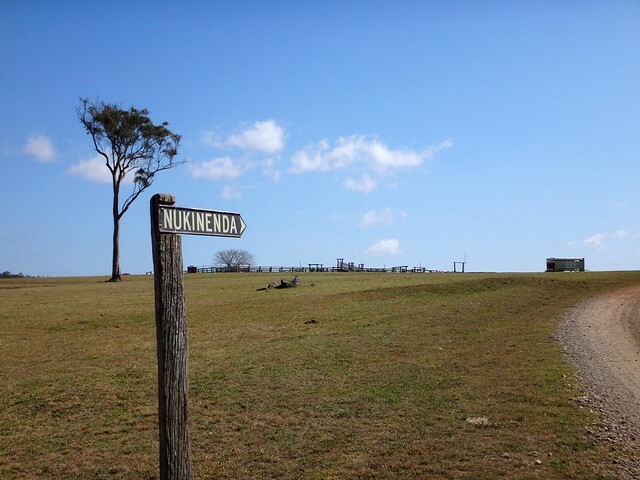 Previosuly it headed eastwards through Nukienda Station, ending up at Eskdale. 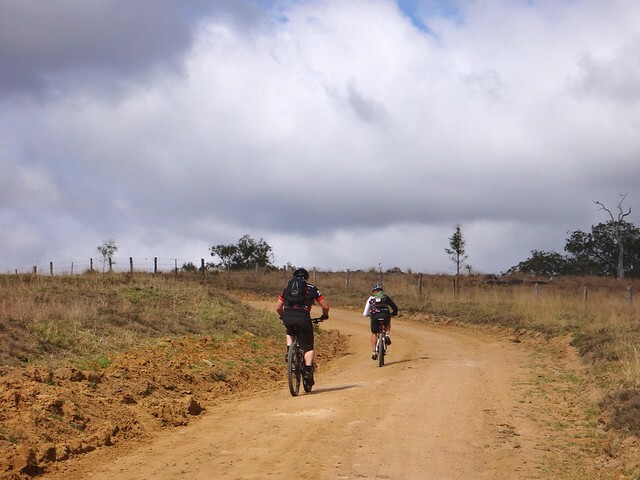 Today, our track took us further south, on an alternative part of the trail to Anduramba. Anduramba Hall is a charming old building made from Galvanized Iron and surrounded by boundless plains of farmland. It was just past the halfway point of the ride, and had a friendly little picnic shelter out front, so we stopped here for lunch. The grounds surrounding the hall were well looked after. The gardens were carefully maintained. The buildings were in good repair. In the city, we take this sort of thing for granted. I slowly turned around and couldn’t see another human anywhere. I realized that caring for a place like this, far from anywhere, takes a lot of work and dedication. 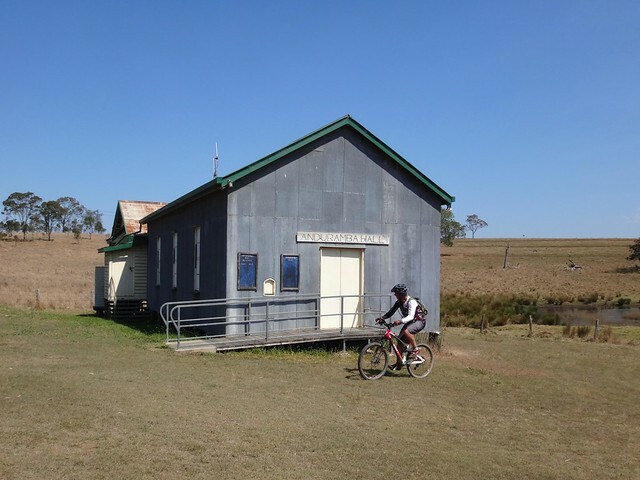 These cheerful rural halls are hallmarks of a generous community spirit. 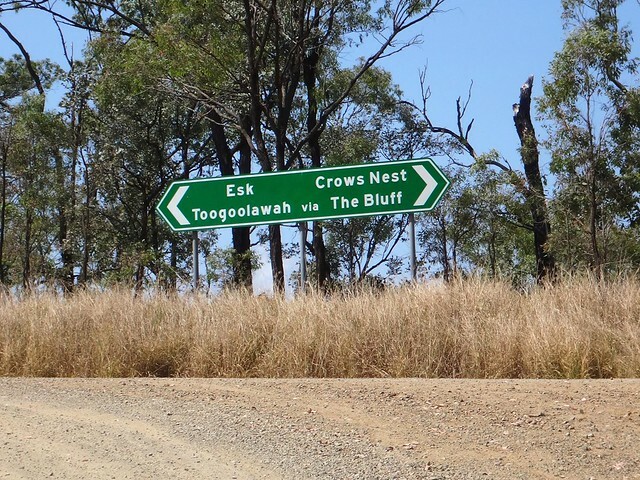 At this point we started heading east towards Toogoolawah. On future rides it might be fun to turn right instead, and explore “The Bluff” and Crows Nest. What do you think, Eric? 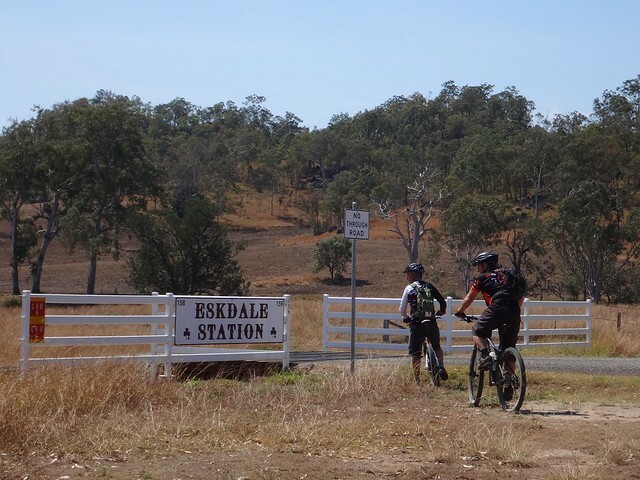 Halfway along the road to Toogoolawah, we stopped at Eskdale Station. This was where we met up with the old Bicentennial National Trail route again. The road here is hilly. Eric and Darb looked tired, hot and thirsty. 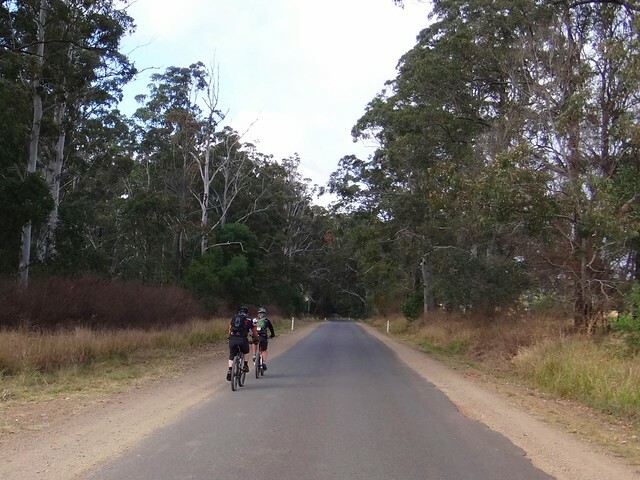 Darb told me they were averaging about 20 km/h for the ride. That’s a cracking pace almost twice the speed we normally ride at. It was an impressive effort. 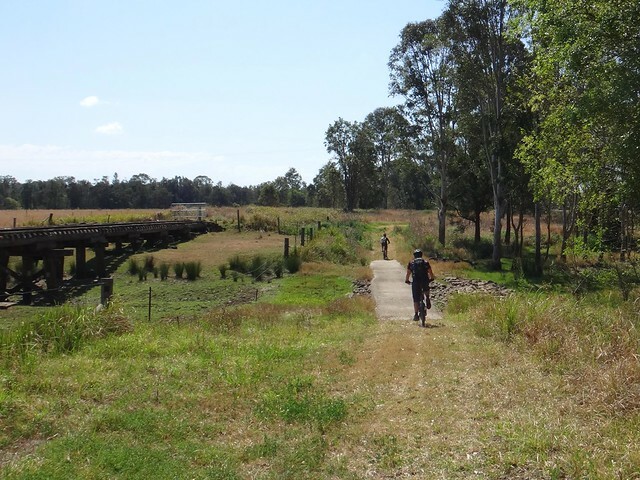 As they rode off, I had a look at Ivory Creek – one of the major watercourses in this area that eventually flows into the Brisbane River. The water here is crystal clear. On a hot day like this it was really tempting to ditch the clothes and jump in. I made my way back to Toogoolawah to wait for my friends. 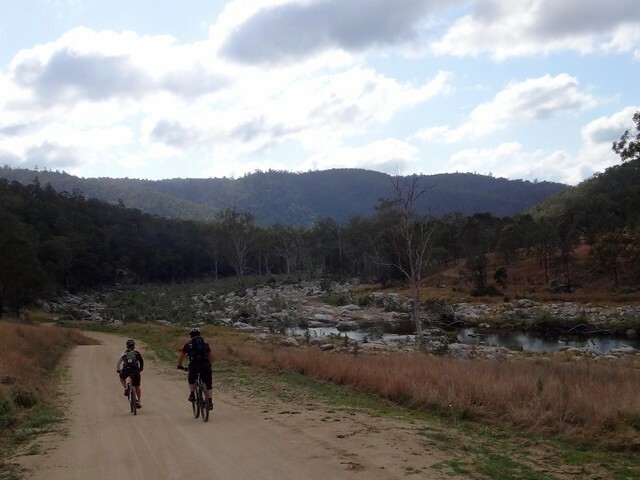 The last part of their ride was northwards along the rail trail. 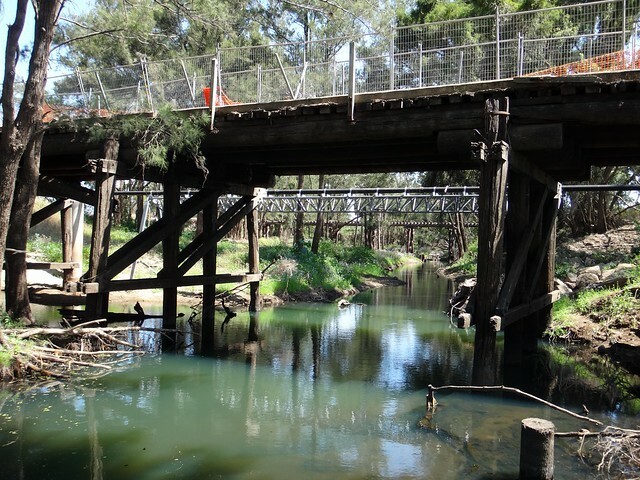 Although the trains are gone, the railway bridge over Cressbrook Creek is still there. 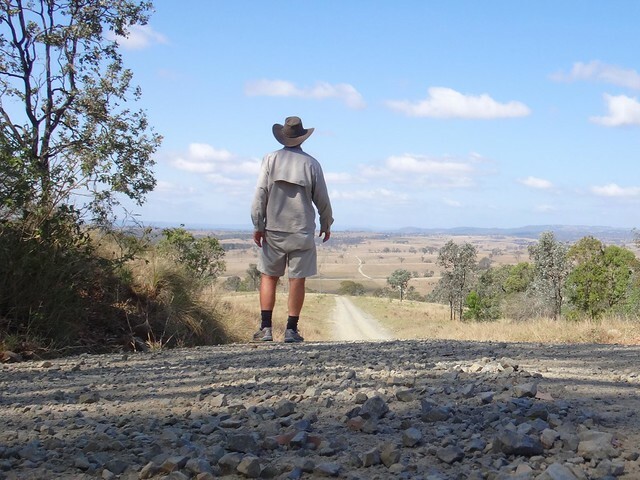 As I stood at the trailhead near Toogoolawah, I could see Eric and Darb in the distance. They had done it. Slightly disappointed I couldn’t ride it with them, I was still grateful for being able to experience such a beautiful adventure. All up, 78km in four and a half hours, including breaks. 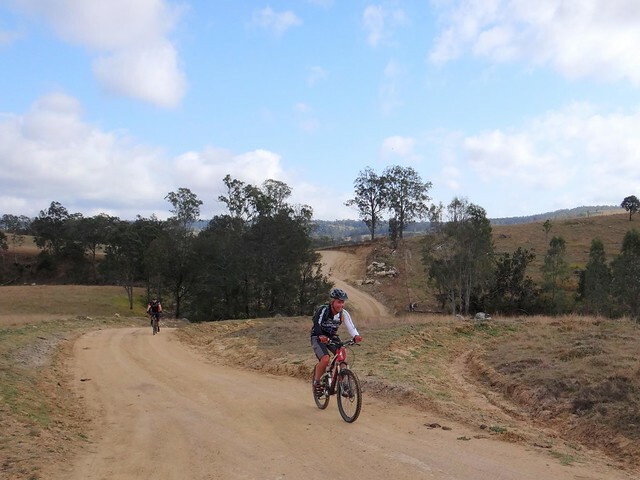 There was about 1,400m of climbing and about 1,700m of descent. Average moving speed of 20.6 km/h. An amazing effort. Darb tells he he’d like to rate this one 9 out of 10 on the tough-o-meter. On this early spring day it was hot. In summer it would be really difficult. Thanks, Eric and Darb, for including me in a great day. Fantastic read and photos Neil. I particularly like that first photo with the road winding off into the distance. By the way, what is the name of that road? BTW all of my photos are geotagged, so if you view them in Flickr you should be able to see the location on a map. Thanks for reading. It’s reassuring to be able to have fun adventures even while I’m injured, and it was generous of the guys to include me in the ride. Thanks Neil. Hope the healing is going well. A nice little story, the dog of the owner called ‘Radnor’ got killed by truck in 1935 and the hotel was renamed. The hotel is very bike friendly, we parked our bikes on the verandah outside our room. The staff were fantastic. 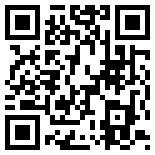 I have some tracks for you if you want to ‘turn left’ and head out to the Bluff! I had a beer with Leigh Gault, the owner of the Radnor, when I was in town with my boys a couple of years back. He’s a facinating old bloke. Yes – I’ve had a look at “The Bluff” on the map and I think it would be good to have a look around up there. So if you could send a few tracks, that would be great! 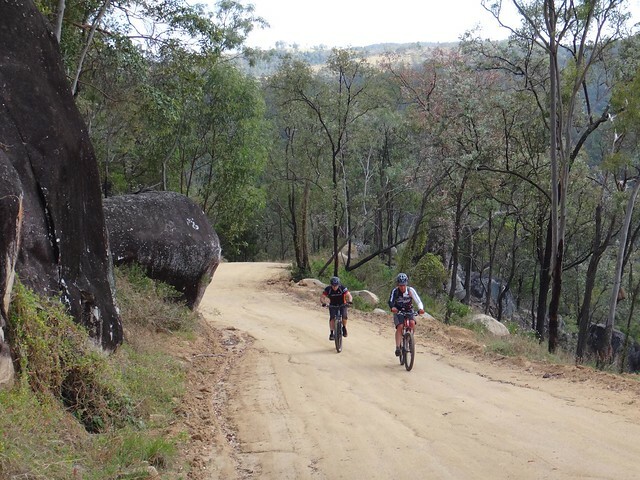 Gee you guys rode beyond the black stump and back, good to see the Tempo was a bit higher, Eric looks a bit plump to much livin i suspect in fraance 😉 just kidding ..
Is Eric riding a carbon fibre EPIC frame these days? I came across this when searching for Anduramba. Our Dad was the teacher at Anduramba School, from 1955 – 1957, and my sisters and I went to school there. The school has of course long since closed, but it looks as though it is now part of the hall – probably moved to that location after it closed. I can’t wait to take a drive there and see how much I can remember!! Thanks for leaving a comment. I’d love to see any photos you have of the old school if you have any. Anduramba is a beautiful part of the world. 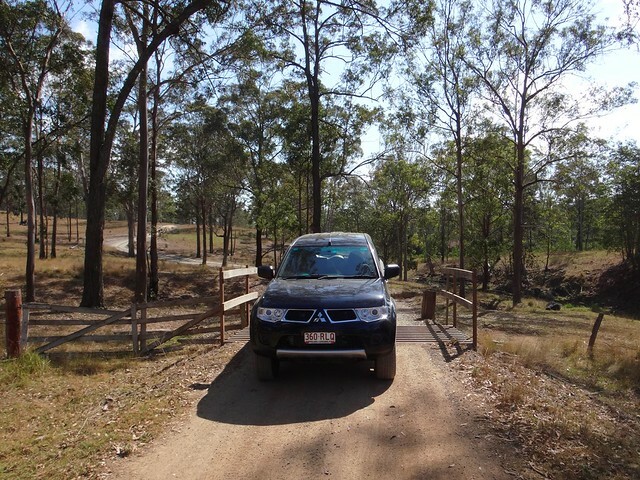 If you get a chance, try driving down the dirt road from Blackbutt – it’s really pretty, and can easily be done with a 2WD in dry weather. I hope you enjoy your return! Actually our Dad was even then a home movie buff. And yes we do have some 8mm film of Anduramba and Crows Nest in that period 1955-1957.